So, a week or so ago the BF and I were lying in bed (not doing anything, so you can just get that out of your mind) when *CRACK* the whole thing collapsed out from under us. A knot in the wood had caused a weakness in one of the beams and the whole thing was irretrievable. So the bed was broken (boo!) which meant getting a new one (yay!) but the one that we liked didn’t come with the big cushions for the headboard (boo!) so I had to go to Spotlight to try and find something similar (yay!). 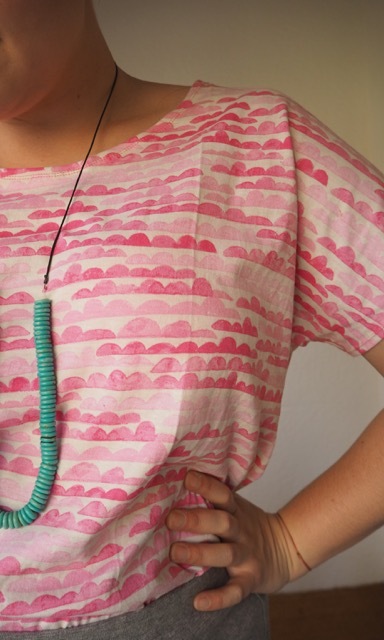 Which is a very roundabout way of telling you that I found some awesome fabric that reminds me of the clouds in a dawn sky, and I thought I’d buy it and using my well-fitting Finki top as a template make another boxy t-shirt. It is, figuratively speaking, a copy-paste job (hence the blog title) so you don’t need a pattern, you just need a top that fits well, and doesn’t have any tricky seaming. The Finki tee is a perfect examples because it doesn’t even have separate sleeves. Front and back are both just one piece of fabric. 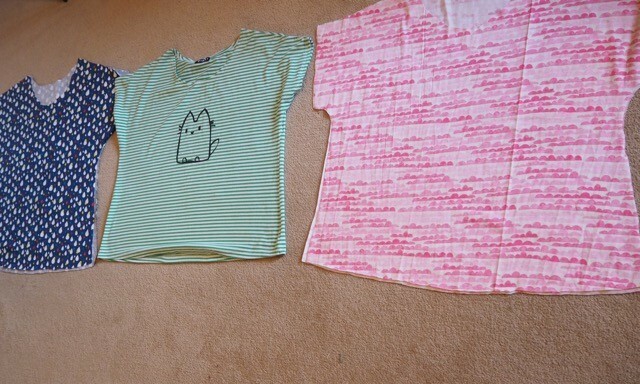 So – to start you need to lay your t-shirt out on your fabric: If you’re using a fabric with a directional print don’t forget you’ll need to cut your yardage in half and lay it reverse-side up behind the first piece, or you’ll end up with half your top upside down: Pin your tee to the fabric, then cut around it, adding a cm or two for seams. 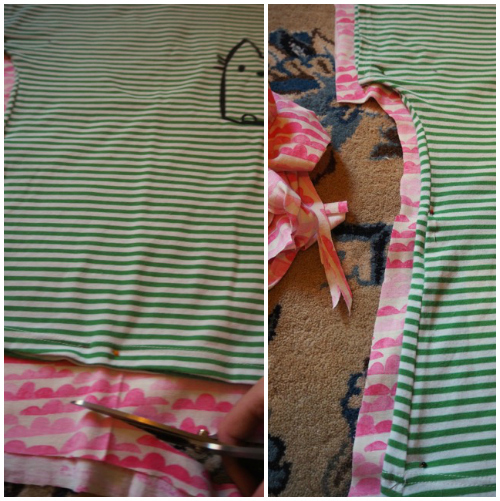 For the lower neckline at the front you should be able to make the shape out with your fingers. 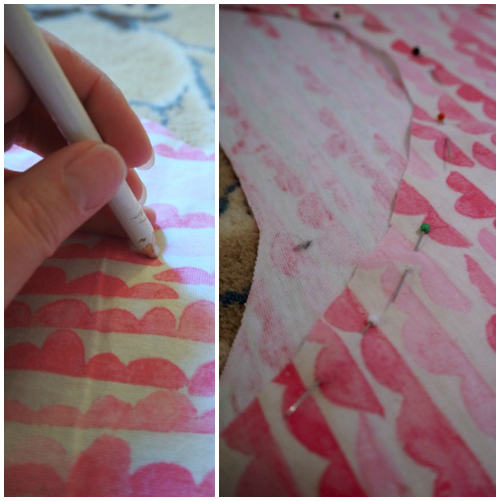 Trace the shape with a fabric pencil, or just with pins. 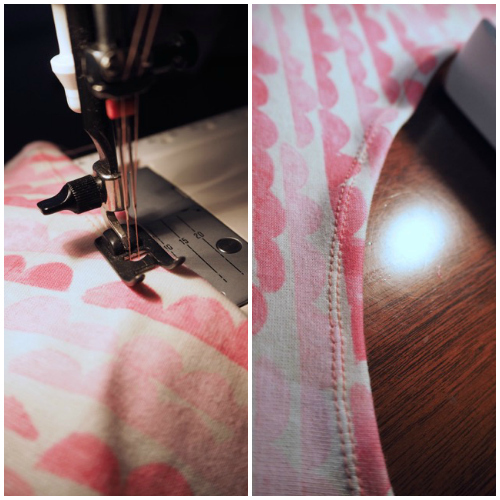 On just one piece cut out the front neckline – don’t forget to add your seam allowance! 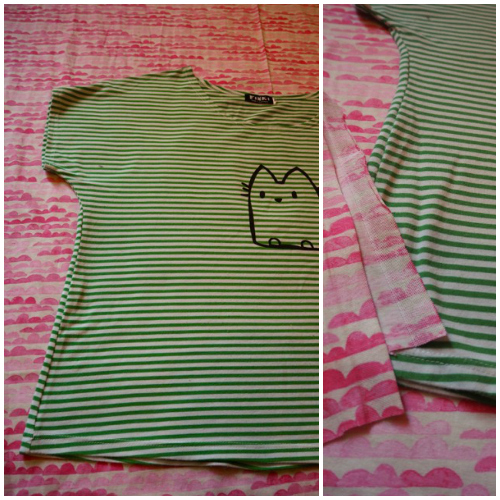 If, hypothetically, you had bought more than one pieces of fabric to make into t-shirts, so would be the time to use the two pieces of your new tee-shirt as a template. Hypothetically. Ahem. So. If you’ve got an overlocker everything just got a whole heap easier for you than the rest of us. 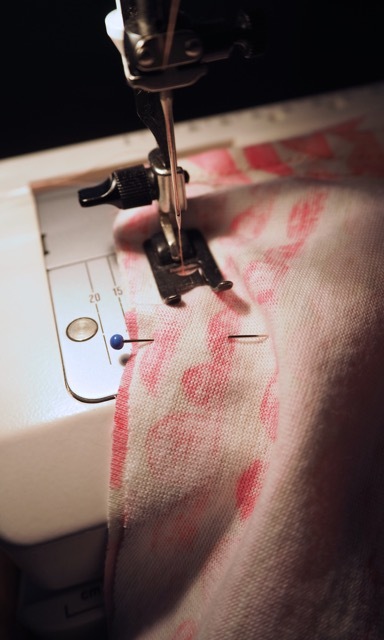 But then, if you have an overlocker you probably are a much more experienced sewer than I am, so you’re not even reading this part anyway because this tutorial is way below your skill set. Right sides together pin the two pieces at the shoulder, then down both sides. 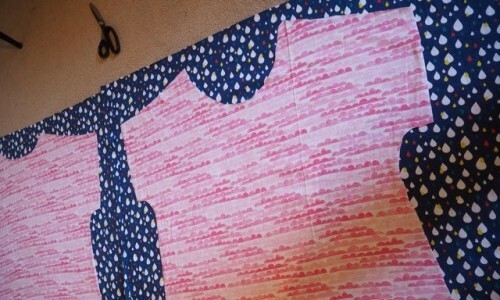 Swap your double needle back for a single and sew the two pieces together where you’ve pinned. Now all you’ve got left to do is finish the armholes and the hem. I did this with a double needle again. Because: Neat.